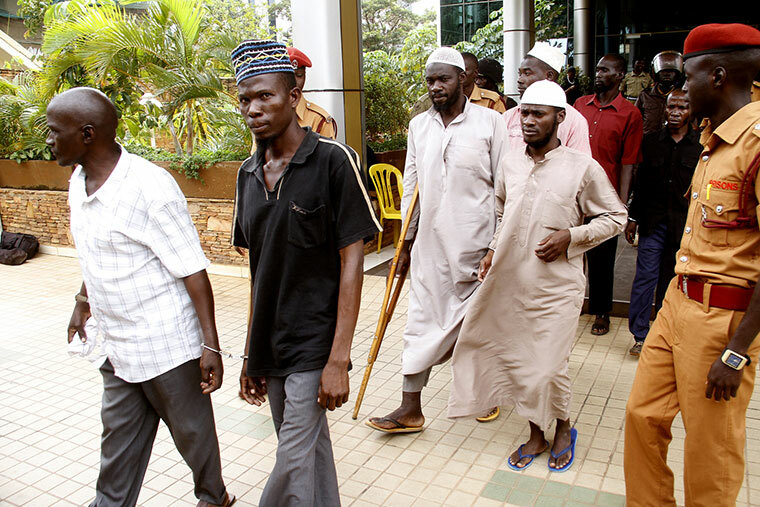 KAMPALA – Eight people charged with the murder of the former police spokesperson Andrew Felix Kaweesi and his body guard have asked court to hang them to death. This was after one of the suspects a one Mr Yusuf Nyanzi collapsing while he was being led to court for the hearing of their bail application pending the hearing of their case and also the trial judge first calling their lawyers to her chambers a move they thought that their case would be adjourned for the third time. The group appeared today at the High Court of the International Crimes Division before Justice Lydia Mugambe where it was established that the group had been kept in the court cells without food yet Mr. Nyanzi suffers from stomach ulcers. “Why doesn’t court just hang us instead of tossing us around, we are fed up of being humiliated and subjecting us to embarrassment,” the suspects shouted on top of their voices. This did not go on well with the trial judge thus ordering the prisons Authorities never to bring hungry prisoners to her Court who are fainting and cannot stand, adding that there is no where it is written that imprisonment is a deprivation to food. She then adjourned their bail hearing to Friday this Week, March 1, after Prosecution’s Marion Ben-Bella indicated that she needed two days to secure vital documents for this application.